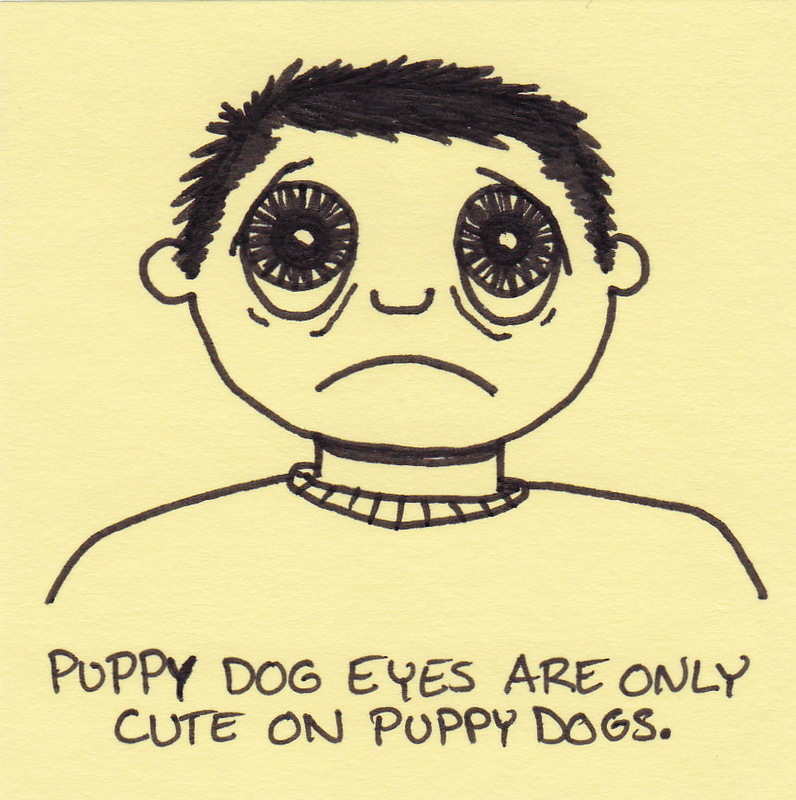 Puppy dog eyes are only cute on puppy dogs. It’s true. Someone should really tell the folks who draw Japanese anime. Those cartoons just look creepy. 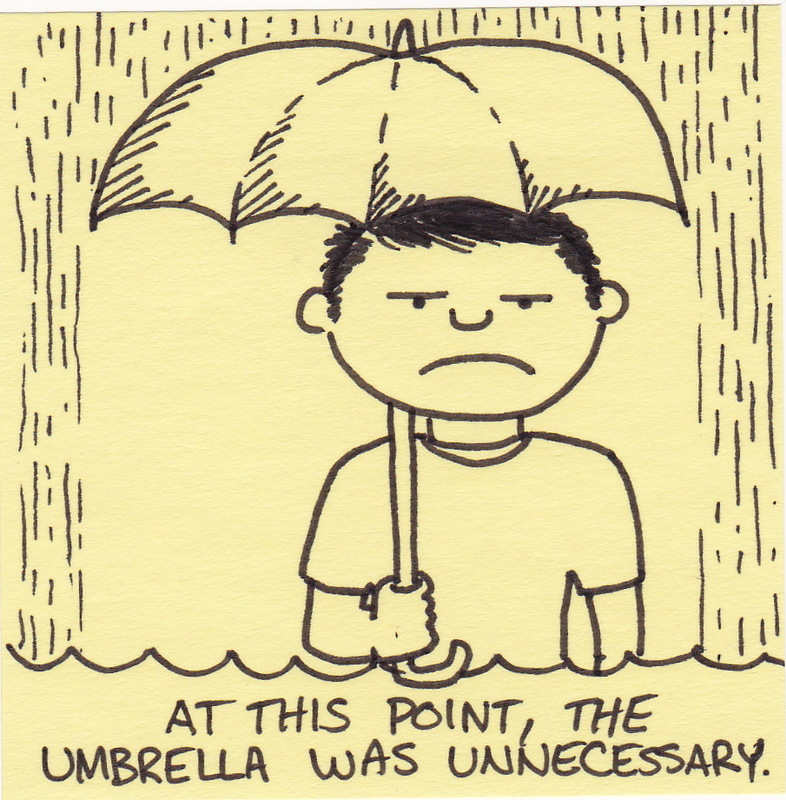 At this point, the umbrella was unnecessary. Our summer was terrible. It rained nonstop. From about May until September we had wet and cold weather nearly every day. Usually I fight dandelions and other invasive weeds in my lawn. This year it was mushrooms. Mushrooms. I recycle. I drive a fuel efficient vehicle. I buy locally grown and organic foods when possible. I have a compost pile to fertilize my garden. I even bring my own reusable grocery bags to the store. You owe me, Mother Earth! Let’s start with better summer weather. He doesn’t sweat the details. I could have made a google search for a picture, but that sounds a little too dangerous for me. 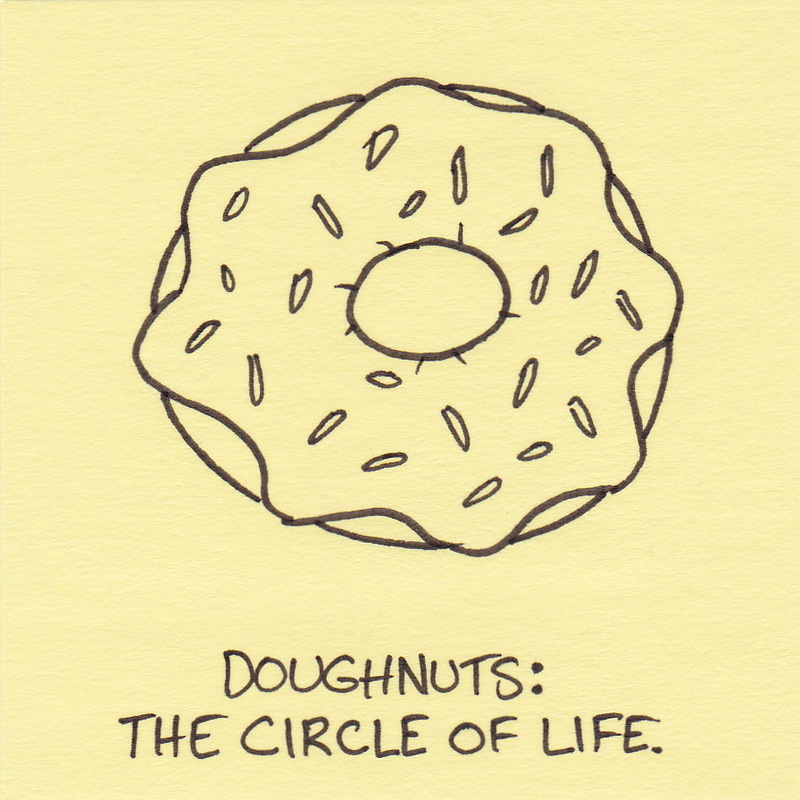 Doughnuts: the circle of life. Yup. This changes the whole meaning of that Lion King song, doesn’t it. About 8 years ago I had the chance to help someone who was raising chickens from eggs. I was present at the hatching of one of the baby chicks. When it emerged from the egg, I had to remove it from the group because it was unable to use one leg and was thus a target of the other, stronger chicks. I decided to see if it could survive with a little extra attention and care. It didn’t just survive – it thrived. As it grew, it’s leg strengthened. More amazingly, it turned out this little chick was quite clever. In fact, I was able to teach it several tricks. It would come when called, sit and stay, and even play dead (lay on it’s back until I tapped it’s belly). 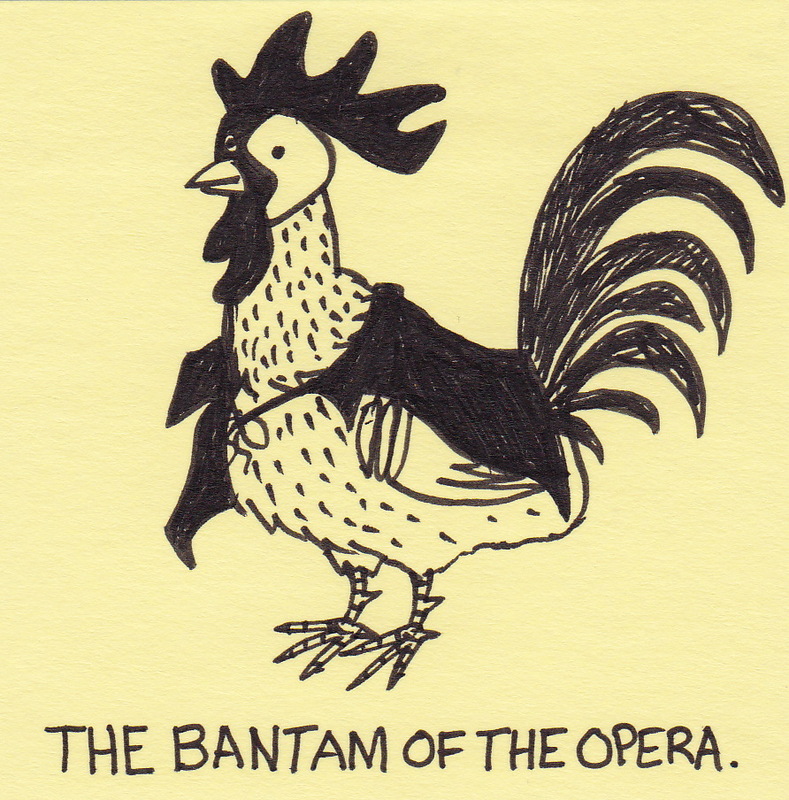 Not bad for a chicken, eh? 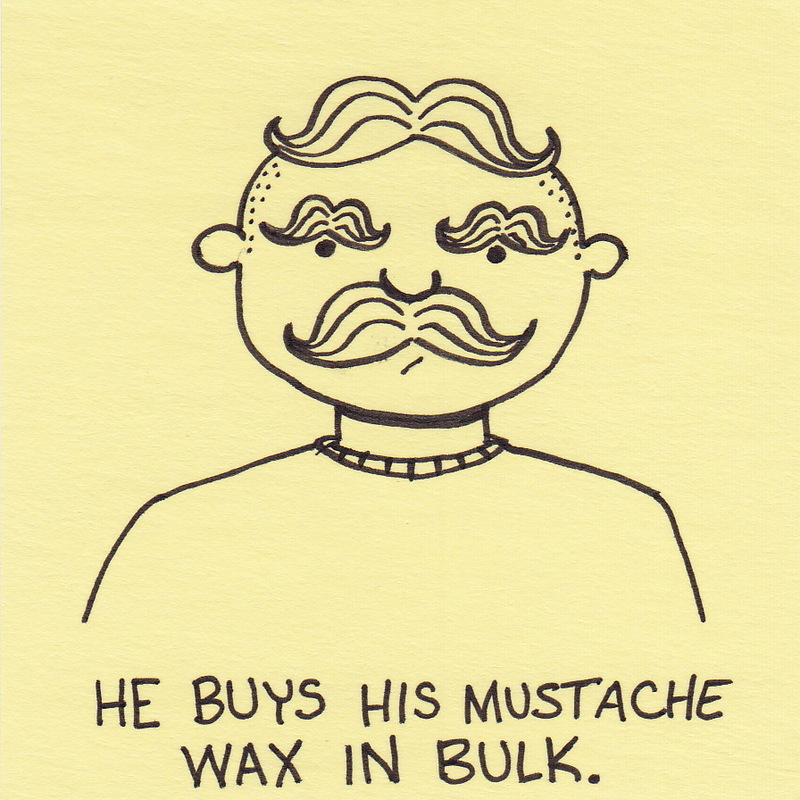 He buys his mustache wax in bulk. My Father always had a mustache. Always. He grew it in his early 20’s and never shaved it again. It was always there – although the style changed a number of times. At one point he even waxed his mustache. He used the wax to curl his mustache at the ends in a manner similar to this fellow. It was… unique. Apparently, it was also memorable because whenever I draw a mustache it usually is of the same style (like here, here, here, here, and here). Although the “handlebar” mustache might not have been the most fashion-forward choice, at least my Father never waxed/curled his eyebrows. 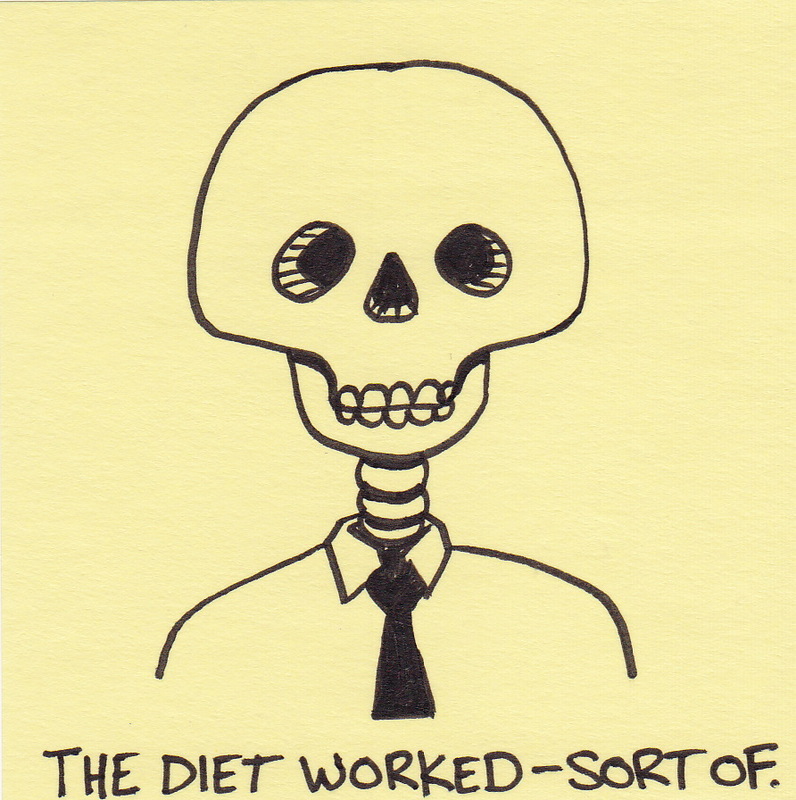 The diet worked – sort of. When I sat down to draw this one earlier today, I started by drawing the same sad little man that usually shows up in these comics. Next, I took a second sticky note and put it on top of the drawing. Then I drew the skull and neck in the actual proportions needed to provide the original character with a believable support structure. You are currently browsing the Inkjot blog archives for September, 2010.